Liferay Home is one folder above the domain to which you will be installing Liferay. For example, if your domain location is /Oracle/Middleware/user_projects/domains/base_domain, then your Liferay Home is /Oracle/Middleware/user_projects/domains. For this section, we will refer to your WebLogic server’s installation location as $WEBLOGIC_HOME. Before you begin, make sure you have downloaded the latest Liferay .war file and Liferay Portal dependencies from http://www.liferay.com/downloads/liferay-portal/additional-files. The Liferay .war file should be called liferay-portal-6.1.x-<date>.war and the dependencies file should be called liferay-portal-dependencies-6.1.x-<date>.zip. These instructions assume you have already configured a domain and server and that you have access to the WebLogic console. Note: WebLogic 10.0 supports JDK 1.5 but does not support JDK 1.6. Now that you have all of your installation files, you are ready to start installing and configuring Liferay on WebLogic. Liferay requires several .jar files including the Liferay Dependency JARs and a JAR file for your database driver. The following steps describe how to install these .jar files properly. Navigate to the folder which corresponds to the domain to which you will be installing Liferay. Inside this folder is a lib folder. Unzip the Liferay dependencies archive to this folder so the dependency .jar files are extracted into the lib folder. If WebLogic does not already have access to the JDBC driver for your database, copy the driver to your domain’s lib folder as well. You will also need the xercesImpl.jar copied to your domain’s lib folder or you will get SAX parsing errors after you deploy Liferay. You may download this from http://xerces.apache.org. Create a folder $WEBLOGIC-HOME/jrockit_150_15/jre/lib/endorsed. Then copy commons-lang.jar, liferay-rhino.jar, serializer.jar and xalan.jar to the endorsed folder you just created. Now that you have your WebLogic installation is loaded up with JAR files for Liferay to use, let’s consider how to configure your database. If you want WebLogic to manage your data source, use the following procedure. If you want to use Liferay’s built-in data source, you can skip this section. Browse to your WebLogic Console. Click the Lock & Edit button above the Domain Structure tree on the left side of the page. 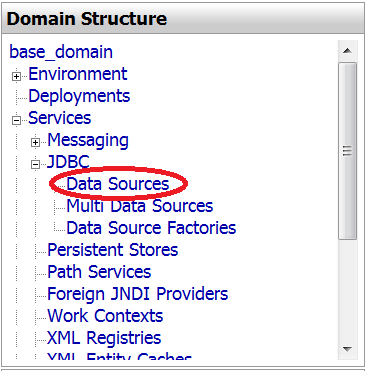 From the Domain Structure tree on the left, select Data Sources. Then click the New button on the right side of the screen. Give the Data Source a name, such as LiferayDataSource. Define the JNDI name as jdbc/LiferayPool. Select your Database Type, the Driver class and then click the Next button. Accept the defaults on the next screen by clicking Next. On the next screen, put in your Database Name, Host Name, Database User Name and Password. If you have been following the defaults we have been using so far, you would use lportal, localhost, root, and no password as the values. Click Next. The next screen allows you to test your database configuration. Click the Test Configuration button. If the test succeeds, you have configured your database correctly. Select the check box of the server to which you want to deploy this Data Source (AdminServer is the default). Click Finish. 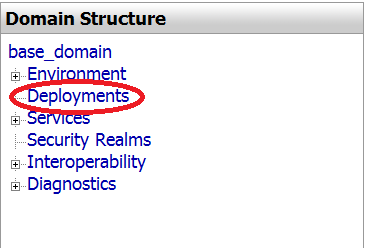 Click the Activate Changes button on the left, above the Domain Structure tree. Great work! Your data source can now be managed from within WebLogic. Next, let’s consider the mail session for your domain. If you want WebLogic to manage your mail sessions, use the following procedure. If you want to use Liferay’s built-in mail sessions, you can skip this section. 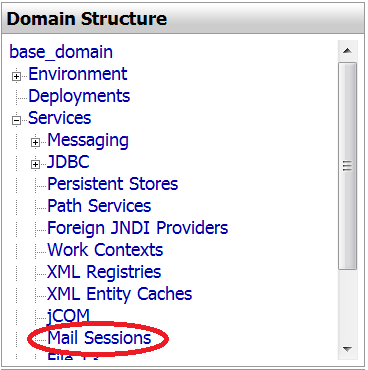 In the Domain Structure tree, select Mail Sessions. Then click the Lock & Edit button again to enable modifying these settings. Click the New button which is now enabled on the right side of the screen. Give the Mail Session a name, such as LiferayMail. Select your new LiferayMail session from the list by clicking on it. On the screen that appears, define the JNDI name as mail/MailSession and set your JavaMail properties. Click the Save button. Click the Targets tab. Select the check box of the server to which you want deploy this Data Source to (AdminServer is the default). Click the Activate Changes button on the left side of the screen, above the Domain Structure tree. Now you have your mail session specified and ready for Liferay to use. In order for special characters and other languages to display correctly, you must set -Dfile.encoding=utf8 under JAVA_OPTIONS in the setDomainEnv file. Let’s revisit domain configuration to make sure we’ll be able to access your data source and mail session from Liferay Portal. First, navigate to the Liferay Home folder. Otherwise, if you are using Liferay Portal to manage your data source, follow the instructions in the Deploy Liferay section for using the setup wizard. If want to use Liferay Portal to manage your mail session, you can configure the mail session within Liferay Portal. That is, after starting your portal as described in the Deploy Liferay section, go to Control Panel → Server Administration → Mail and enter the settings for your mail session. Liferay can now communicate with your data source and mail session. It’s now time to deploy Liferay! Follow the instructions in this section to deploy Liferay Portal to your domain. Before you deploy Liferay Portal, consider whether you want to use the setup wizard. Start the setup wizard along with Liferay Portal - Do this if you want to configure your portal, set up your site’s administrative account and/or manage your database within Liferay. If this is your first time starting Liferay Portal 6.1, the setup wizard is invoked on server startup. If you want to re-run the wizard, specify setup.wizard.enabled=true in your properties file (e.g. portal-setup-wizard.properties). The setup wizard is invoked during server startup. Start Liferay Portal without invoking the setup wizard - Do this if want to preserve your current portal settings. To start the server without triggering the setup wizard, specify setup.wizard.enabled=false in your properties (e.g. portal-setup-wizard.properties or portal-ext.properties file). The portal-setup-wizard.properties file the setup wizard creates has setup.wizard.enabled=false conveniently specified for you. Note: Property values in portal-setup-wizard.properties override property values in portal-ext.properties. Now that you have enabled or disabled the setup wizard, let’s move on to deployment of Liferay Portal. In the Domain Structure tree, select Deployments. Then click the Lock & Edit button above the Domain Structure tree. Click the Install button on the right side of the screen. Click the Upload your file(s) link. Browse to where you have stored the Liferay .war file, select it and then click Next. Select the Liferay .war file from the list and click Next. Leave Install this deployment as an application selected and click Next. Give the application a name (the default name is fine). Leave the other defaults selected and then click Finish. WebLogic deploys Liferay. When it finishes, a summary screen is displayed. Click the Activate Changes link on the left above the Domain Structure tree. In the Deployments screen, select the Liferay application and click the Start button. Select Servicing All Requests in the pop up. Click Yes to continue on the next screen to launch Liferay Portal. If the setup wizard was disabled, your site’s home page opens in your browser at http://localhost:7001. Otherwise, the setup wizard opens in your browser. For more information on how to use the setup wizard, please see the section above. Congratulations on your deployment of Liferay Portal on WebLogic 10!